This is the second article of a three-part article. Part I provided background for this thought exercise and identified the size of the hole that the 76ers had to climb out of to make the playoffs. Part II addresses the path an expert might take to arrive at his or her opinion. This part of the article has two objectives. First, it attempts to use a reliable methodology and sound reasoning to arrive at a determination that the 76ers will make the 2015-16 playoffs. Second, it takes a step back and questions whether such a result, which may appear ludicrous (and not in a good way like Tesla’s Ludicrous Mode) to many readers, should be able to survive a Daubert challenge. This article blazes the path for a testifying expert to opine that one of the worst teams in NBA history was expected to qualify for the playoffs. Of course, there is probably no need for such an opinion to ever be proffered in a courtroom. However, this thought exercise may help crystalize arguments for and against excluding certain expert testimony under Daubert (and its progeny) grounds. This article is comprised of three parts. Part I provided background for this thought exercise and identified the size of the hole that the 76ers had to climb out of to make the playoffs. Part II addresses the path an expert might take to arrive at his or her opinion. Part III will address the implications of this thought exercise on valuation-related Daubert challenges. This part of the article has two objectives. First, it attempts to use a reliable methodology and sound reasoning to arrive at a determination that the 76ers will make the 2015-16 playoffs. Second, it takes a step back and questions whether such a result, which may appear ludicrous (and not in a good way like Tesla’s Ludicrous Mode) to many readers, should be able to survive a Daubert challenge. Recall that our assessment date is approximately one quarter of the way through the season when the team signaled that a change in strategy may be forthcoming. The first part of this article identified the expert’s need to identify a path for thirty-six or thirty-seven wins (we will focus on thirty-six) over the remaining sixty games of the season. This second part of the article identifies the sources for these wins. The analysis should start with a projection of wins for the status quo (i.e., no change to the players on the team). The FiveThirtyEight.com analysis referenced in the first part of this article projected the 76ers to win thirteen additional games over the remainder of the season. 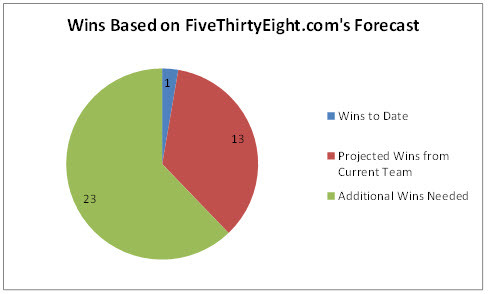 As shown in Figure 1, our expert needs to find an additional twenty-three wins, or sixty-two percent of the team’s total wins for the season, if s/he uses FiveThirtyEight.com’s projection for the status quo. We will assume that our testifying expert is more optimistic than FiveThirtyEight.com but that his/her optimism must have limits (and a supportable basis) in order to survive a Daubert challenge. We will assume that this expert projects the status quo team to win twenty additional games over the remainder of the season. 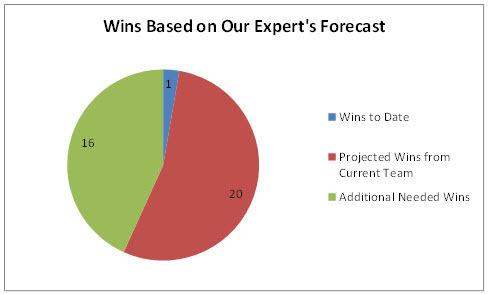 As shown in Figure 2, our expert needs to find an additional sixteen wins, or forty-three percent of the team’s total wins for the season, if s/he uses his/her more optimistic projection for the status quo. This is another example where two experts may have divergent views on a topic. Recall in the first part of the article that our expert arrived at a lower threshold for making the playoffs than the contemporaneous FiveThirtyEight.com projection (thirty-seven wins vs. forty-three wins). Divergent views on multiple topics, where one expert consistently zigs (e.g., conclusions result in a low value) whereas the other expect consistently zags (e.g., conclusions result in a high value), can result in ever-increasing gulfs between proffered opinions. The next step is to find the sixteen additional wins needed to make the playoffs. The first source of additional wins is the net benefit from new players obtained via trades (or other avenues of player procurement) that replace old players. The second source of additional wins is the resulting synergies that occur when new players are introduced to the existing talent. The 76ers’ most valuable trade chip was probably the team’s own first round pick in the upcoming 2016 draft. This pick would be the most likely to win the draft lottery and result in the top pick in the next draft if other teams’ management believed the 76ers would continue their losing ways. The value of the 76ers’ own first round pick in the 2016 draft for this exercise is a conundrum. On the one hand, this pick was very valuable if other teams’ management (like FiveThirtyEight.com) believed the 76ers were expected to continue their losing ways over the remainder of the season. On the other hand, this pick loses (substantial) value if potential trading partners believed the 76ers were expected to (substantially) improve over the remainder of the season. Thus, lower (higher) perceived value of the draft pick suggests less (more) improvement that the team needs to make through subsequent trades. The next most valuable trade chip was probably the Los Angeles Lakers’ top-3 protected first round pick in the upcoming 2016 draft. This pick could also result in a substantial haul for the 76ers if they chose to trade it. The 76ers had other valuable trade chips too. For example, the team could trade Joel Embid (the former #3 pick in the draft that was out for the year with an injury) and/or Dario Sakic (the former lottery pick that was playing in Europe). The team also owned several additional first and second round picks in future drafts as well as the right to swap first round picks with the perennially underachieving Sacramento Kings. These players, draft picks, and/or rights to swap draft picks could be traded for other players that would help the current team without incurring any costs to the current team. How much are these trade chips worth in terms of players that can contribute to the 2015-16 team? Their value is debatable. However, these trade chips could be worth a lot in the short-term if the 76ers decided to prioritize their current team over their future teams. There may be a reasonably reliable methodology that could be used to value the players that the 76ers obtain in exchange for these trade chips. 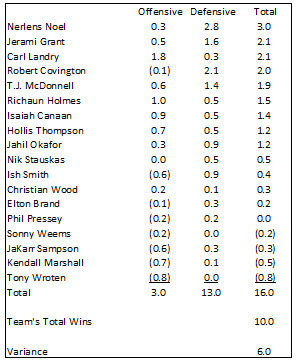 A metric called “win shares” attempt to measure the amount of wins a basketball player contributes to a team. This methodology is conceptually similar to the methodology developed by famous sabermetrician Bill James that assesses the value an individual player contributes to a baseball team’s success. 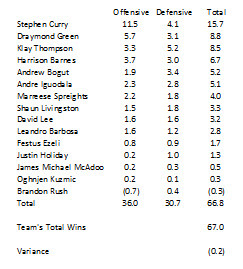 Basketball-Reference.com publishes win shares for every player in the league that “is calculated using player, team and league-wide statistics, and the sum of player win shares on a given team will be roughly equal to that team’s win total for the season.” For example, as shown in Figure 3, the total win shares for the players on the 2014-15 Golden State Warriors was 66.8, which is essentially the same as the team’s sixty-seven wins during that season. The preceding discussion is important for Daubert-related challenges. It may be possible to credibly opine that the win share methodology has been tested, subjected to peer review and publication, and attracted widespread acceptance within the relevant scientific community. 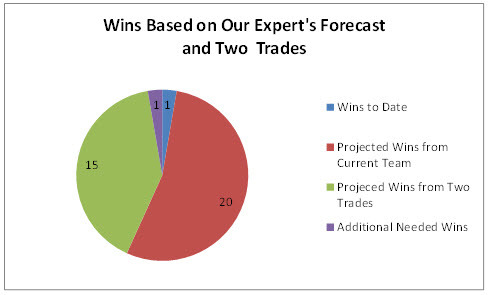 These factors suggest the win share methodology might be valid for Daubert-related purposes. There is also empirical data regarding the error rate for the win share statistic. Basketball-reference.com reports the average absolute error is 2.74 wins and the root mean squared error is 3.41 wins. Identification and assessment of this error rate may further suggest that the win share methodology is valid for Daubert-related purposes. A focus on win shares also demonstrates the 2015-16 Philadelphia 76ers, in hindsight, may have been better than their record. As shown in Figure 4, their sixteen win shares were sixty percent greater than their ten actual wins during the course of the season. (Of course, this observation is irrelevant to anyone who shares renowned football coach Bill Parcells’ view: “You are what your record says you are.”) This variance is larger than the error rate mentioned above, which may suggest that the 76ers’ final record was partially attributable to bad luck that was not foreseeable as of earlier dates, which include our December 7 assessment date. The data in Figure 4 also reveals that the 76ers’ roster was essentially devoid of currently valuable players. This observation matters because any player obtained in a trade provides a benefit (in terms of his win shares) but also has a cost (in terms of win shares lost from the player’s minutes that are replaced). Fortunately, the lack of talent on the 76ers’ rosters limits the “leakage” (i.e., opportunity cost) as most of the acquired players’ win shares flow through to the team’s bottom line. Which Players to Target in Trades? He is a very valuable (#16 in the league) player as he contributed 9.7 win shares during the 2015-16 season. This production was presumably foreseeable as of our December 7 assessment date because he contributed at a similar rate (0.177 vs. 0.185 win shares per forty-eight minutes as a Celtic) during the previous season. He had an affordable contract, which matters for purposes of managing the salary cap. His salary was approximately seven million dollars, which is coincidentally almost equal to the amount of room the 76ers had under the salary cap. Thus, no players of importance would have to be traded by the 76ers in order to make the salary cap math work. He is a point guard that would replace Ish Smith, the point guard the 76ers acquired after December 7 who generated essentially no win shares over the course of the season. Thus, virtually all of Isaiah Thomas’s win shares flow to the bottom line. He was under team control for the next two seasons at a below market (based on the win shares he produced) rate. This means he has future value too, and would require a larger trade chip than the next player we will address. We may need to assume that the 76ers’ most valuable asset (its own first round pick in the upcoming draft) is required to make this trade. If that is the case, it is better to make this trade before making a subsequent trade to acquire additional players. This is so because the 76ers’ own pick in the upcoming draft diminishes in value as the talent on the current team increases. It is reasonable to assume that the Celtics would trade Isaiah Thomas for the 76ers’ first round pick in the upcoming draft. Moreover, many would probably believe (for reasons that will be addressed later) that the Celtics got the better of this trade (due to the benefits in future seasons) by a country mile. He is a very valuable (#11 in the league) player as he contributed 10.3 win shares during the 2015-16 season. This production was presumably foreseeable as of our December 7 assessment date because he contributed at a similar rate (0.221 vs. 0.233 win shares per forty-eight minutes) during the previous season. His salary was approximately one million dollars, which means no players who helped the current team had to be included to make the salary cap math work. He was a pending unrestricted free agent and his team did not have his “Bird Rights.” The Heat (or any team that traded for him) could not offer a better contract to him than other teams. Thus, Hassan Whiteside was the ultimate short-term asset as the value of owning his contract, like Cinderella’s carriage, ended at the stroke of midnight (i.e., the end of the season). He is a center (the preferred position played by the 76ers best player: Nerlens Noel) but he could have played in a “twin towers” lineup with Noel. After all, the 76ers planned on teaming the plodding Jahil Okafor with Nerlens Noel. Noel and Whiteside make a more logical pairing. The Heat may have been in “win now” mode during the 2015-16 season, but it is not unreasonable to suggest a scenario where they gave up Hassan Whiteside’s one year of cost effective production in exchange for the many years of cost effective production represented by the 76ers’ future assets. We will assume that the 76ers traded the Lakers’ top-3 protected pick for Whiteside. We have identified a path to approximately fifteen wins over the remaining sixty games of the season through these two trades. Thomas and Whiteside are projected to contribute approximately twenty wins over the course of a full season. This prorates to approximately fifteen wins over the approximate seventy-five percent of the season that remained as of our December 7 assessment date. As shown in Figure 5, our expert is now only one win away from identifying the source for the thirty-six wins the team needed after our December 7 assessment date to make the playoffs based on his or her threshold. The one additional win could come from a variety of avenues. Perhaps the synergies from adding two top-16 (based on win shares) players in the league to the 76ers’ team is enough to bridge the gap. If not, additional short-term assets may be obtained in the trades that netted the 76ers Thomas and Whiteside, or could be acquired by trading additional future asset(s). It seems reasonable to determine that the addition of two top-16 players would catapult the 76ers from worst to good enough to make the playoffs. This is especially the case given our expert’s relatively optimistic assumptions regarding the team’s existing talent base and the amount of wins required for making the playoffs that we are assuming will survive a Daubert challenge. Thus, there may be a reasonable basis to support our expert’s opinion. It also seems reasonable to conclude that Thomas and Whiteside are not top-16 players, despite their placement on the win share leaderboard. Thomas is signed to an affordable contract because the league did not value him as a top-16 player when he was a restricted free agent a year and a half before our assessment date. Moreover, the Celtics acquired him months before our assessment date in exchange for assets (Marcus Thornton and the Cavaliers’ first round draft pick) that are not remotely close in value to a top-16 player. Whiteside is a reclamation project that signed for the league minimum. Moreover, some have suggested (especially as of December 7) that Whiteside was not as good as his stats suggested. For example, Whiteside may have led the league in shot-blocking, but his team’s defense was much better as of December 7 when Whiteside was not playing. Thus, there may be a reasonable basis to conclude that our expert’s opinion is not based on a scientifically valid approach. How Credible is This Expert’s Opinion? 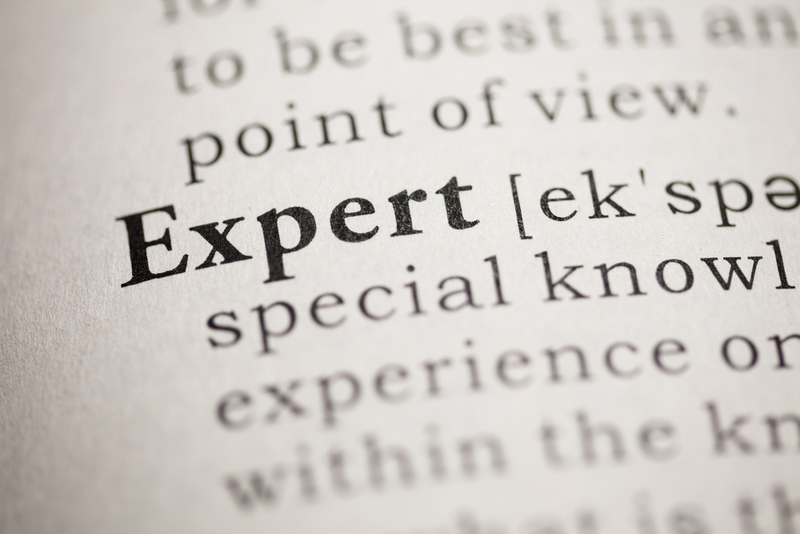 This expert’s opinion may be seen by some as credible enough to survive a Daubert challenge. The thesis is based on a change of strategy (use future assets to benefit the current team) that is plausible and might be buttressed by fact discovery that is consistent with this view. The number of wins needed for making the playoffs is consistent with what frequently happened in the most recent past. The path to finding these wins is based on a methodology that is used within the relevant community and its reliability can be tested. The trades contemplated in this analysis are plausible and, if anything, skewed against the 76ers’ overall interests. In short, there may be ample basis for this opinion to survive a Daubert challenge. A spirited argument can be made for and against excluding our hypothetical expert’s opinion on Daubert grounds. On the one hand, the expert’s opinion may be the product of a reasonably reliable methodology and that criticisms of the conclusion are based on underlying assumptions that should be addressed in cross-examination. On the other hand, this expert’s opinion assumes an unprecedented turnaround, which nobody predicted, was expected to occur. Moreover, the opinion may be based on an unreliable methodology with speculative assumptions that have no basis in reality. These factors may suggest a strong basis for exclusion under Daubert grounds. The ability to argue both sides of this opinion highlights how a wide range of opinions might be able to survive a Daubert challenge. The third part of this article will address the implications of this discussion for valuation-related Daubert challenges. The author is not an attorney and is not offering legal advice. This article is written from a business valuation practitioner’s perspective, who works on, among other things, litigation-related matters. This is the only publicly-available source I found that has a projection for wins as of December 7, 2015. Isaiah Thomas was acquired by the Celtics in a mid-season trade during the 2014-15 season. I am not aware of contemporaneous projections for players’ win shares as of December 7. That is why this article uses what happened in hindsight and compares it to the previous year’s win shares rate to see if it is generally consistent with past performance. Michael Vitti, CFA, joined Duff & Phelps in 2005. Mr. Vitti is a Managing Director in the Morristown office and is part of the Disputes and Investigations practice. He is also a member of the firm’s Complex Valuation and Bankruptcy Litigation group, focusing on issues related to valuation and solvency. Mr. Vitti has twenty years of valuation experience. Mr. Vitti can be reached at (973) 775-8250 or by e-mail to michael.vitti@duffandphelps.com.